It has been a while since my last blog post, but I found it hard to get my head around what’s happening in the world of late. The slow, agonising death of reason and logic, the cynical and immoral exploitation of our democratic ideals of free speech and expression, the inexplicable rise of fascism, neo-Nazis, and white supremacists, the deterioration of our public discourse, and the devolution of much of our political class into scientifically illiterate ignoramuses or populist, intellectually bankrupt husks, have all been difficult to watch, especially as I have grown up in an oppressive society. Watching all this unfold is like being forced to watch a deadly car crash in slow motion … you know where it’s all heading, but you are powerless to stop it. 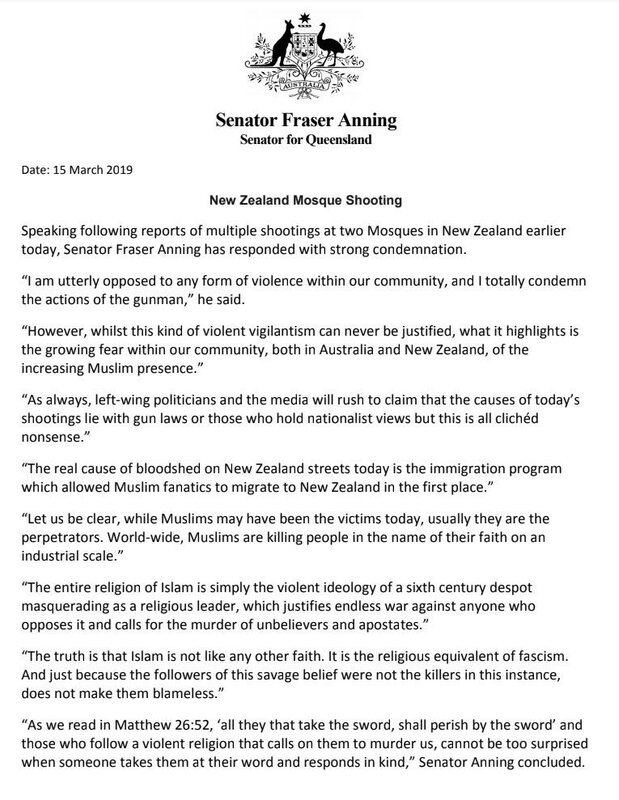 The horrific Christchurch terrorist massacre, the comments of Senator Fraser Anning following that tragedy, and the likely election of Mark Latham into the NSW Legislative Council as part of One Nation were just a few recent reminders how far this nonsense has gone. The man responsible for the Christchurch terrorist attack, sadly an Australian-born man, who shall remain unnamed, uploaded a lengthy, crazed ‘manifesto’ before carrying out the vicious, mindless murders. “I had little interest in education during my schooling, barely achieving a passing grade. I would suggest that ‘barely achieving a passing grade’ during his schooling pretty much excluded the possibility of any university studies, but I think those two sentences from his psychotic ‘manifesto’ illustrate all we need to know about what we are dealing with here: bigoted, ignorant, uninformed, hate-filled violence. I suspect that second sentence was a mere dig at universities because, as institutions of higher learning, they do tend to be inherently progressive and inclusive places, attracting the ire of those immersed in right-wing ideologies. No surprises there, since independent thought and intellectualism are not known to be good friends of extreme ignorant ideologies. I do wonder though what made him think that anyone would be interested in some misguided, bigoted, ignorant, uninformed, hate-filled, meme-infused rantings, which includes a psychotic worldview built on misinterpreted history, coming from someone with a self-confessed lack of interest in education, and barely passing grades?! I wonder if he may have been encouraged by an environment where suddenly everyone is ‘entitled’ to an opinion, no matter how baseless, bigoted, ignorant, or uninformed that opinion is? In recent times our reverence for democracy and freedom of speech and expression of ideas has been permitted to be exploited and perverted to reanimate the ideologies of white supremacy and fascism, including the ‘re-branded’ right-wing, neo-nazi ‘alt-right’ movement. … nothing’s easier than hate and ignorance. They require no effort. These ideologies have been rightfully confined to the graveyard of intellectually bankrupt and inherently evil concepts, because they historically proved themselves irretrievably evil, and an existential threat to peace, humanity, and progress. Sadly, some self-interested, amoral politicians, both abroad and closer to home, have been sensing a political opportunity in exploiting these extremist ideologies to further their own political ambitions, and are deliberately creating a feedback loop that in turn offers a veneer of legitimacy in the eyes of some who are looking for easy answers to complex problems. Frankly, even our Coalition government had fallen into this trap over the past decade or so, by building a winning political platform on demonising asylum seekers from the Middle East. Although they get really offended when this issue is raised, there is simply no getting away from their public utterances on these issues. Social media companies must also take responsibility and tangible action. They still have a very long way to go to meet community standards and expectations when it comes to addressing extremism and hate on their platforms. But so does Scott Morrison, when it comes to the Coalition, and their political playbook. Before Scott Morrison judges the social media operators, he needs to lead by example as the leader of this nation, and quickly and unequivocally condemn, disown, and punish, words of bigotry, hatred, and ignorance from members of his own government, and other players in Parliament, every time they step out of line. He also needs to target directly the far-right, fascist, neo-Nazi, and white supremacist elements of society who are behind a lot, if not most, of these extremist and hateful social media troll storms, and who are currently increasingly emboldened by the standards of our public discourse, the extremist, low, bigoted, and racist tone of which is often set by our political class in the first place, chasing votes by speaking to fear, ignorance, and the lowest common human denominators generally. We haven’t seen this from him. His recent one-on-one interview with The Project’s Walled Ally was a train wreck, with his inability (or unwillingness?) to recognise deep-seated issues of bigotry within his own Coalition on display for all to see. The government’s response to the alt-right pin-up boy Milo Yiannopoulos’ speaking tour, with the government taking four different position on his suitability to be granted entry into Australia in the space of a couple of weeks was cringeworthy. And the recent revelations by investigative journalists about One Nation offering to work to sell out, and water down, our worlds’ best practice gun laws for money from people and entities associated with the American National Rifle Association, left him on the back foot and looking ridiculous when it came to questions about preferences at the next Federal election.. Instead, he demonstrated gobsmacking ignorance and utter tone deafness when, after all that had transpired, he had the gall to suggest that The Greens represent a greater threat to Australia than those who flirt and sympathise with fascism, Neo-Nazis, and white supremacists, does not deserve to be the leader of this nation. Many politicians, even entire political parties, have been deliberately, and knowingly, catering to the lowest common denominators of humanity: bigotry, discrimination, exclusion, hate, homophobia, ignorance, intolerance, misogyny, and racism. And nothing’s easier than hate and ignorance. They require no effort. And these are not ideologies you could reason with, because hate and ignorance know no logic, and are incapable of rational thought or reason. History demonstrates that once they mature into a mainstream political and social movement, they are the perfect storm of hate, ignorance, and violence. There are no moral equivalency arguments, or moral grey areas, here when it comes to confronting these failed and hateful ideologies. Fascism, and white supremacy are anti-human and anti-social. They must be confronted head-on, and stamped out. The appropriateness of Egg Boy’s response to Fraser Anning can be the subject of discussion. Many loved it and saw him as the hero we needed, others were concerned over what they have seen as the potential legitimisation of physical attacks on someone over their free expression. I am going to leave that debate to the side for the moment, and note that one of the men who was accompanying Fraser Anning at the time, and subsequently tackled Will Connolly to the ground, is the convicted criminal, neo-Nazi, and white supremacist Neil Erikson, with a non-custodial warrant out for his arrest in NSW. Birds of a feather?! Erikson, was part of the group which terrorised the Gosford Anglican Church last year, storming the church during Saturday night service, dressed in costumes and brandishing fake weapons. He failed to attend court to answer the charges resulting from those actions, resulting in the outstanding arrest warrant. More importantly, subsequently, Fraser Anning was censured by the Senate. The ‘opinions’ of One Nation, Pauline Hanson, Mark Latham, Fraser Anning, and their ilk, deserve no acceptance, respect, or tolerance. No matter how many votes they receive at an election. Because these ideologies are so ignorant, hateful, and uninformed that even majority popular support can’t make them ‘right’, just populist. We must not fall for intellectually nonsensical demands that we ‘accept’ or ‘respect’ these outcomes because they are the outcomes of our democratic system, and the voters’ desires. After all, democracy is not perfect, and it can get sick, even misfire or fail from time to time – in fact it has been noticeably failing over the past decade or so. But, just because my kitchen sink is full of dirty dishes I’m not going to burn my house down. I will just roll up my sleeves and clean the dishes. Sadly, the election into public office of many fringe-dwelling politicians peddling hate and ignorance are the outcome of a sick democracy and society, just as the rise of fascism in 1930s Germany was the outcome of a sick society. But the utter and complete deterioration of our society to the lowest common denominators is not inevitable. We simply must not ‘accept’ or ‘respect’ the rise of sick, hateful ideologies that have been rightfully assigned to history’s garbage bin. The sickness that has permeated our society is demonstrated by a surreal environment where science is being devalued, even denied, experts are being dismissed, and suddenly everyone is ‘entitled’ to an opinion, no matter how baseless, bigoted, ignorant, or uninformed that opinion is. An ‘opinion’ in the absence of evidence and credible facts, and a reasoned and logical argument, to support it is usually nothing more than bigotry, hatred and prejudice, and such ‘opinions’ have no value in the public discourse. You are only ever ‘entitled’ to what you can coherently and logically argue and factually support.